Perched 50 metres above the Indian Ocean, The Ungasan Clifftop resort offers the unforgettable in-villa experiences, from highly curated breakfast delivered straight to the room to barbecue parties with spectacular views. The Ungasan Clifftop Resort is determined to live up its reputation as the most treasured destination in Bali. Pristine beaches and limestone cliffs dotted with luxurious villas are a few of the many reasons why travellers have fallen in love with the resort. And when you wake up with unparalleled views of the Indian Ocean, directly from your window, now that’s extraordinary. In this prime area, The Ungasan stands out for its setting that perched 50 metres high above the Indian Ocean. This cliff-edge resort offers seven five-bedroom villas, including the famous colonial style Villa Tamarama with two swimming pools. Each villa is set among 2,500sqm of manicured gardens, boasting 30 metres of clifftop frontage that’s fringed by stylish lounges and pavilions. These expansive outdoor living spaces offer contemporary, open-plan interiors with al-fresco bathtubs and lounge terraces. Privacy and exclusivity are The Ungasan’s core. It prides itself on its in-villa experiences, ensuring every guest lives life to the absolute fullest without having to step outside. In-villa indulgences range from spa treatments in the comfort of open-air gardens, to gourmet dining experiences like group barbecues and poolside bites for celebratory occasions. Its facilities also include private butler, nanny, 24-hour room service, ocean front bale, airport transfer and daily car driver. This is the only place where guests can experience Morning Harvest, a highly curated selection of breakfast treats, such as cured cold cuts, oven-fresh muffin and freshly baked sourdough, delivered straight to your villa from The Ungasan Kitchen. Guests can also arrange the in-villa Biota BBQ; an optional dining experience for clifftop get-togethers or special occasions, where fresh local produce is barbecued poolside and served up in utmost seclusion, overlooking the spectacular panorama. The gourmet offerings at the resort have been expertly crafted by acclaimed Australian chef James Viles, founder of the two-hatted Biota Dining in Bowral, New South Wales. He’s the man behind the resort’s world-class culinary offerings, particularly within the resort’s in-villa dining experiences: Morning Harvest and Biota BBQ. Chef Viles is also responsible for the refined cuisine at the resort’s signature restaurant, Selatan, serving pan-Asian cuisine. 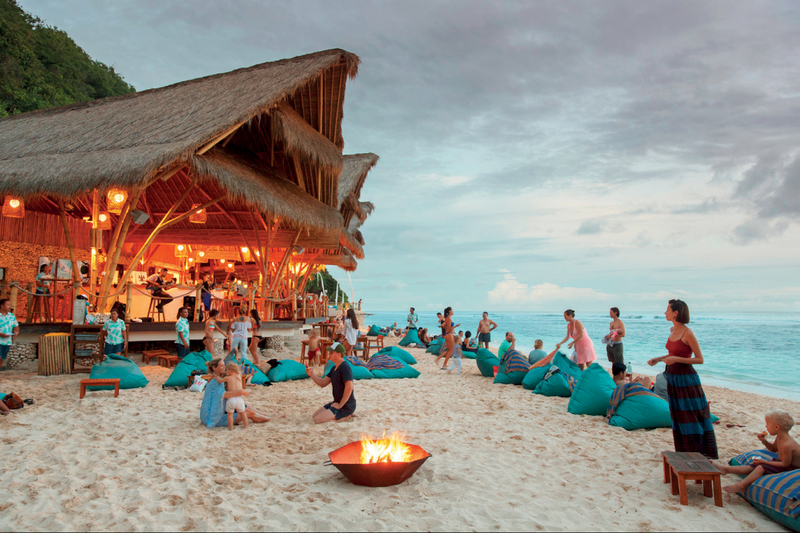 Yet perhaps his most famed culinary contribution at the resort can be found on the seaside-inspired menu of Sundays Beach Club – the resort’s beachfront destination. The beach club is beautifully hidden at the bottom of the cliffs and tucked away in a pristine white sand bay. Villa guests staying at the resort can enjoy complimentary VIP access to the beach club, including a breathtaking decent down the rugged cliff-face on the resort’s own inclinator. As this open-air carriage reaches the powdery white sands, a sun-soaked day of beachfront extravagance awaits, from cocktails and cuisine from Chef Viles, to the fully-staffed sunbeds, watersport attractions and evening bonfires. Complementing the resort’s exclusive experiences and five-star destinations is its Balinese hospitality. It has a passionate team of private butlers and service staff, who give “service from the heart”. For more information on The Ungasan Clifftop Resort or to book your stay, visit www.theungasan.com or email reservations@theungasan.com.